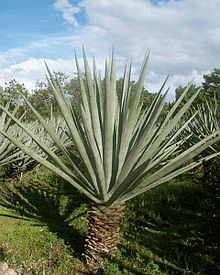 Sisal, also known as sisal hemp, Agave sisalana, is a tropical American plant cultivated for its leaf fibers. It has a short stem and its sword-shaped leaves are cropped at intervals and their fibers extracted to make coarse ropes and twine. In the plantations, flowering is prevented by removing the leaves so that each plant lives about 20 years. Family: Amaryllidaceae.